In the spring of 1983, moonlighting from my regular job in transportation at the Berks Heim, I found myself nights flipping pizzas at the now defunct "Showbiz Pizza Place" (located at the current "Jimbos" Muhlenburg Shopping Plaza) It was there that Dave Petrie of Music Mania befriended me and convinced me to be an up start DJ in training. Dave was playing music on Friday nights for teen nights. I remember still being depressed over the closing of the Reading Fairgrounds Races. I tried my hand at go-karts, but it didn't make sense to risk my life for a little plastic trophy, plus it was a money pit. All I wanted to do at that time was work away the blues. So I jumped at the chance to start something promising and fun. Dave used the Silver Swallows in Five Points as a training ground for me. "Everybody was so understanding, they were all like aah, let the kid play! Everybody remembers their first date, my first wedding was at the Kenhorst Fire Company, and the second was at the Newmanstown Fire Company. I was terribly insecure back then and I felt I had no personality. I kept thinking of that song "Stage Fright" from "The Band". "Your brow is sweating and your mouth gets dry, the moment of truth is right at hand, just one more nightmare you can stand." Thats how it is when your first starting out. But in that same song my old friend Rick Danko sings "You can make it in your disguise, just never let them see the fear in your eyes." Well it sure helped. In the mid 1980's I found myself in the waterbed industry selling and installing old fashioned hard framed wooden waterbeds for Waterbed Concepts and later National Bedrooms. One night as I was doing an install for Jeannie Gring's brother and we got talking. Jeannie being an officer at Riverside Beneficial Association hired me for music nights at the club. Down the road the Riverside Baseball Bashes would be some of the most memorable events of my career. Those nights were so energized, 300 plus crowd. I rolled back and forth on an office chair from one side of the stage to the other just so I could lean over and get the request. And of course that was the age of vinyl. We cheated with cassettes only to avoid the needle bouncing. Times were so different then. You basically had three choices for equipment. Big, bulky band equipment, home stereo equipment, and Radio Shack. All the lights were homemade. We used plant grow lights from K Mart, spray bombed the holders black and used colored reflector bulbs. Sequence light boards were just coming out on the market and they were primitive. Everything was grass roots and homemade. 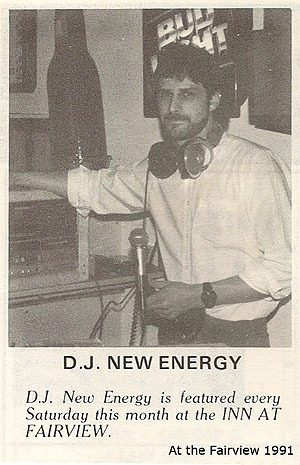 Also at that time there were about 6 DJs in the yellow pages. Now there's about 50. As time went on I crafted my skill and evolved a DJ personality. There was a trick to that too but I'll keep that card to myself. Gordon Lightfoot once said "If you want to do it the best, you just have to do it the most." And thats what I tried to do. I should mention DJ RIP also took me under his wing for a time sending me to the coal region, namely Frackville and Ashland for jobs here and there. When cds hit the market it was a revolution, but they still weighed a ton. I spent so much time compiling and organizing music not realizing that computers would change the business again. Through the 80s and 90s many gigs and many weddings took place, and eventually the equipment evolved to what it is today. Theres not one piece of equipment that I still use from the beginning except for one. My hand truck, old faithfull has been with me to every single job. It was a Christmas gift from my father, Stormin Norman. Dave Petrie sold Music Mania around 1991 to become a day trader and traveling troubadour around the nation. But my mentours teachings are well learned in my soul. Dave always said "your most important piece of equipment is your ear, and always set youself up." In the 90s I also performed some jobs for Wanda Shannon (Mike Shannons wife, Y102) Shamrock Sound. I'll never forget the Christmas party I played for Y102, who was that guy! From 2000 to 2003 I took a hiatus, to reorganize, recover, and for spiritual growth. It not only saved my life but usherd in a Renaissance for my career. The best days for New Energy were still ahead. Starting in 2003 I completely revamped my system from top to bottom. Lap tops were the way to go and it freed me to concentrate on so many other areas. LED lighting was taking off and you had to be wise about what you purchased. You can get so carried away that you end up moving and setting up too much equipment. I also began to market myself more to the wedding market. Attending select bridal shows and creating a websight will make the difference in your entire year. But in the end an honest days work and a card in hand will get you repeat business. For me its all about networking. Today everything is pretty much exactly where I want it to be. The Bose L1 Model 2 speaker system is the best sound on the market, my light show is unique and extrordinary, and my experience, talents and abilities (I believe) are at their peak. God willing, as long as I am physically able I will play as long as I can. Its become a labor of love. There are so many experiences, people, places, and things to thank and mention I would have to wright a novel to tell it all. Below is just a snippet of that story. So getting back to the song "Stage Fright" Rick Danko ends the song... "When he gets to the end, he wants to start all over again, please dont let him stop, lets take it from the top, to start all over again. Al Tasnady appreciation night at Goodwill Fire Co. with Dave Petrie. DJ'd the breaks for "The Jordan Brothers" at The Alley during the Winter Carnival in Pottsville. Those unforgettable Riverside Beneficial baseball bashes. Provided sound for wrestling at the Silo February 23rd 1993. Huge Harley Davidson wedding in Honey Brooke, it was the real deal. Announcer for the Duryea Hill Climb, 1993, 2008 to 2011. MC and DJ for "The Lighthouse Cafe / Hardbean Underground"
King Frost Parade Float. In 2003 Gary provided sound and portrayed a character on a float sponsored by "The Bridge" church in Hamburg Pa. The song played was Kerry Livgren's "Mask Of The Great Deciever" The float won 2nd place. Helping to setup and run sound for the Nicky Cruz crusade in Reading Pa.
After the turn of the millenium, Gary became the mainstay at notable car shows in the area. I.E. Kauffmans BBQ Ranch, Stoudts Auto Sales Corvette Show, Faulkner Chevy, American Legends Car Show Longs Park Lancaster Pa, Kempton Car Show, Polish This Car Show, and Brickles Corvette Show. Goth wedding at Blue Falls Grove Halloween weekend resembling something from "The Renaissance Faire"
Phillies themed wedding with Harry Kalas introducing the bridal party on cd. Wedding at the Belmont Mansion overlooking Fairmont Park and the Philadelphia skyline. Egyptian wedding for the twin sisters of the Ibrahim family. Double wedding for twins at Golden Oakes Country Club. site map | manage this site | C4Site Factory™ is a trademark of Echo Valley Graphics, Inc.